We have held over April’s Dorkbot meeting to host an artist talk by Tim Plaisted on Thurs 7th May in the CCAS gallery. 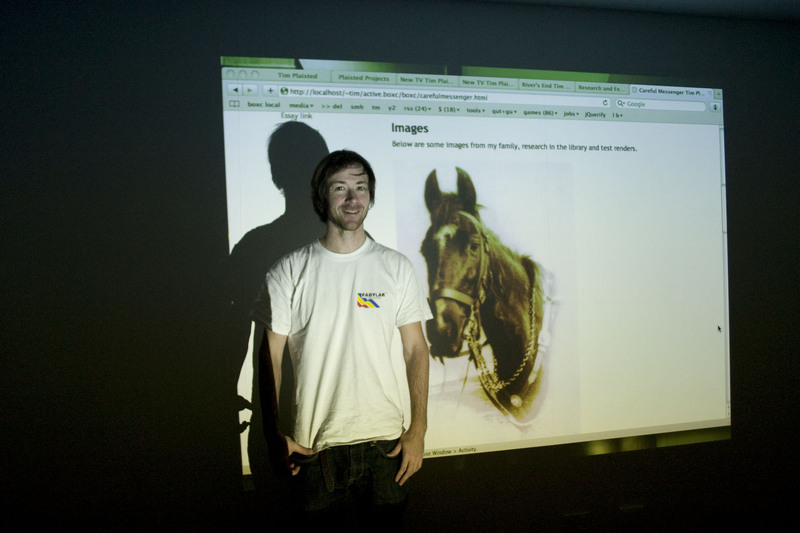 Tim Plaisted is an artist living in Brisbane working with media art. Plaisted’s work has been exhibited in Australia, Mexico, South Korea, Singapore, Thailand, UK, USA and reviewed in Artforum. His current work, Careful Messenger (2008) continues an exploration of realtime 3d and game tools in media art from recent works, River’s End (2007) and Handheld (2006). His earlier work, Surface Browser (2004), was commissioned for the National Endowment for Science, Technology and the Arts UK gallery launch and included in “2004: Australian Culture Now” national survey of contemporary art. Surface Browser as well as networkdposition (1999) and 24Hr Coverage (2000) were included in three MAAP (Multimedia Arts Asia Pacific) Festivals in Australia and Singapore. Tim is in town to install and open his recent work Careful Messenger in the Cube space at CCAS the show opens on Friday May 8 at 6pm.